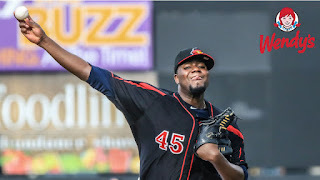 ROCHESTER, N.Y. -- The Rochester Red Wings and Pawtucket Red Sox split a Tuesday night doubleheader at Frontier Field. The series continues Wednesday night at 7:05 p.m. with a Salute to Pro Wrestling featuring an appearance by WWE Hall of Famer Mick Foley, and a $1 Wednesday, with $1 Zweigle's hot dogs, peanuts, chips, and Cracker Jack. The first game was a continuation of the July 5 suspended contest, which was stopped after a scoreless top of the first inning. Twins pitcher Michael Pineda took the mound for the Red Wings, making his fourth appearance as part of a minor league rehab assignment and first appearance with the Wings. The Red Sox scored first in the top of the second inning after Josh Ockimey hit a solo home run, making the score 1-0. The Red Wings scored in the bottom of the third inning against Red Sox starting pitcher, Chandler Shepherd after a 2-RBI single from Gregorio Petit, scoring Juan Graterol and Taylor Motter, making the score 2-1. Next batter, Kennys Vargas hit a sacrifice fly to score Nick Gordon, making the score 3-1. Next batter, Lamonte Wade hit an RBI triple, scoring Petit to make the score 4-1. Other than the lead-off home run in the second, Pineda was flawless allowing just a pair of hits over four innings while striking out a pair. He threw 55 pitches, 32 for strikes. He was replaced by DJ Baxendale. Travis Lakins came on in relief for Shepherd to begin the bottom half of the sixth. Shepherd went 5.0 innings allowing four runs on seven hits while walking two and striking out five. He threw 97 pitches, 65 for strikes. The Wings got to Lakins in the sixth after an RBI double from Motter allowed for Jeremy Hazelbaker to score, extending the lead to 5-1. Pawtucket got two back in the seventh after a leadoff double by Ockimey was followed up with a two-out single from Oscar Hernandez to put runners on the corners. A past ball allowed for Ockimey to score and a single from Mike Miller brought home Hernandez to make the score 5-3. Rochester got a run back in the bottom of the inning after a two-out single from Graterol, his third hit of the game, allowed for Wade to score, increasing the lead to 6-3. Baxendale's night ended after the sixth as he was replaced by Nick Anderson. Baxendale allowed four hits resulting in two runs over his two innings pitched. Over the last two innings of the ball game, Anderson allowed a lone single to secure the win for the Red Wings. Lewis Thorpe got the start for Rochester in Game Two of the doubleheader and was solid through two innings, as was Pawtucket pitcher Josh Smith. Pawtucket got to Thorpe in the third inning after he allowed a pair of walks to begin the inning. Following a strikeout, Thorpe allowed a go-ahead RBI single to Rusney Castillo to give the Sox a 1-0 lead. Tony Renda then followed up with a three-run home run that carried over the right field wall, increasing the lead to 4-0. After allowing a walk and a base hit following the home run, Jake Reed came on for Thorpe. Thorpe went just 2.2 innings allowing four runs on four hits while walking three and striking out four. Thorpe threw 61 pitches, 34 for strikes. Kennys Vargas got the Wings on the board in the third with a 470-foot home run that flew off the bat of 117-mph. The home run was Vargas' 20th of the season, also bringing home Nick Gordonand leaving the score at 4-2 in favor of the PawSox. Rochester cut into the deficit again in the fifth after Willians Astudillo lifted his 12th home run of the season, making the score 4-3. Luke Bard came on to pitch the fifth, replacing Reed who went 2.1 perfect innings which included five strikeouts. Smith worked 5.0 innings, allowing three hits and three earned runs, He walked two, fanned six and threw 87 pitches - 56 for strikes. In the sixth, the PawSox added a run on an RBI double by Mike Miller.